Monday, October 18, 2010 \PM\.\Mon\. 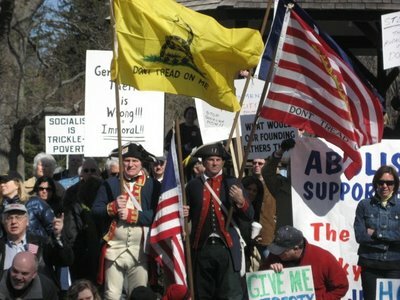 With the political storm clouds gathering over the horizon for November, I want to take this opportunity to explain why I will be voting for GOP candidates (specifically Tea Party candidates when possible) at the midterm elections. It is not because I “believe in” the Republicans, or because I think that a Republican Congress is going to lead America into a new golden age. It is because the Obama/Democrat agenda must be slowed down, and more importantly, because I do not share the hierarchy of priorities or values of the left. As a young convert I was very much intrigued by the ongoing discussion between Richard J. Neuhaus, George Weigel, Michael Novak and Fr. Robert Sirico — and their critics, ranging from David Schindler (editor of Communio) to Tracey Rowland and Alisdair MacIntyre. This has sometimes been described as a debate between ‘Catholic neocons’ and ‘Catholic paleocons’; ‘Whig-Thomists’ vs. ‘Augustinian Thomists’ (the latter by Tracey Roland in a famous two-part interview with Zenit). What are the religious and philosophical foundations of the ‘The American Experiment’? Is the liberal tradition (understood in the sense of democracy, human rights and the free market) a help or a hindrance to the life of the Church and evangelization? Is capitalism and the free market compatible with Christian morality and the social teachings of the Catholic Church? What is the proper role of religion in the public life of America today and how ought we to interpret the ‘separation of Church and State’? What is the proper understanding of freedom, conscience and religious liberty in Catholic tradition?. . . in other words, the kinds of questions that we at American Catholic are largely preoccupied. To aid in my readings and research on this topic I started a website, “The Church and the Liberal Tradition” and a blog, “Religion and Liberty” which was largely active from 2003-2006. Saturday, June 5, 2010 \AM\.\Sat\. Yesterday, June 4, was the twenty-first anniversary of the brutal suppression of the pro-Democracy protests in Tiananmen Square in Beijing. Over 3000 of the protestors were murdered by the Communist government of China. Tyranny won that round, but I have absolutely no doubt that Democracy will ultimately prevail in the Middle Kingdom. When it does, the heroes and heroines of Tiananmen Square will be remembered and their murderers forgotten. Monday, March 22, 2010 \PM\.\Mon\. The U.S. Conference of Catholic Bishops made a determined effort for universal health coverage, without abortion, in the run-up to the vote on ObamaCare. In the end, due to the abortion language in this bill, they condemned it in its entirety. Now I believe that our bishops had the best intentions of wanting universal health coverage, but this violates the principle of subsidiarity. The Principle of Subsidiarity is the handling of affairs by small-scale, bottommost, or minutest government. In 1891 Pope Leo XIII wrote an encyclical, Rerum Novarum, which said that government should undertake only those initiatives which exceed the capacity of individuals or private groups acting independently. Functions of government, business, and other secular activities should be as local as possible. If a complex function is carried out at a local level just as effectively as on the national level, the local level should be the one to carry out the specified function. Private insurance agencies cover over 84% of all Americans, with an overwhelming 93% saying they are satisfied with their coverage. And those that are uninsured, can get readily available treatment for a serious illness. Including illegal aliens. So why the bishops haste and aggressive posturing in pushing for something everybody already has and are satisfied with?